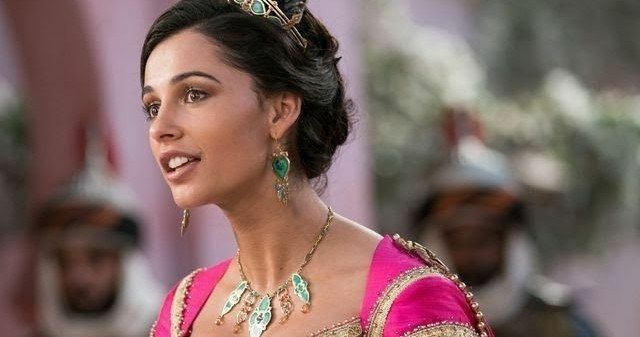 We have a brand new image of Naomi Scott as Princess Jasmine from Disney's live-action Aladdin. A couple of weeks ago, Disney released the first images from the upcoming reimagining of their 1992 animated classic, which drew something of a mixed response. But that mostly had to do with the fact that Will Smith's Genie wasn't quite what everyone was expecting. Now, we have a new look at one of the movie's most important characters. Naomi Scott broke out in the recent live-action Power Rangers, which helped her land the gig as Jasmine in the new Aladdin. This latest image sees here looking elegant and royal from head to toe. At this point, it's really tough to say how the movie is going to turn out, since the initial teaser trailer really didn't give us too much in the way of context, but Scott certainly looks the part. Starring alongside her in what's described as a "bigger and brighter" take on the story is Mena Massoud as the titular Aladdin. Disney went through a long and intense casting process in order to find someone with the right blend of skills for the part. Much like in the original animated movie, Princess Jasmine will wind up falling for this street rat. As Naomi Scott explains, the two make for a perfect couple, as they both have a lot to learn from one another. "They're the perfect partnership because they both need each other and teach each other." While many of the story beats are going to be the same, this version of Aladdin is going to change some things up. For her part, Naomi Scott wants to play up the strength and intelligence of her iconic Disney character in this new live-action take, which comes from director Guy Ritchie (Sherlock Holmes, King Arthur: Legend of the Sword). Jasmine is going to be motivated by doing what she thinks is best for the people of Agrabah. "She gradually finds the courage to speak out against injustice and that's kind of her objective from the start of the movie: 'I see these people, I love them.'" In addition to Aladdin, Disney also has other remakes of animated classics on the way this year with Tim Burton's Dumbo set to hit theaters in March, and Jon Favreau's The Lion King heading our way in July. The Mouse House has had a tremendous amount of luck with similar remakes in recent years, with movies like Alice In Wonderland, Cinderella, Beauty and the Beast and The Jungle Book all doing big business at the box office. Will that trend continue with these latest remakes in 2019? Aladdin arrives in theaters on May 24. Be sure to check out the new photo of Princess Jasmine from USA Today below.